This is another long delayed post. It's from our July vacation in San Francisco. One day we were at Golden Gate Park and it it was about lunch time so we were hungry. We decided to try the de Young Cafe at the museum - fortunately you don't need to be visiting the museum to have lunch there. 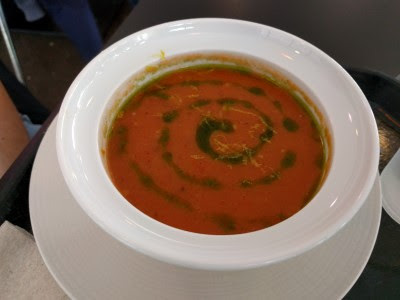 SP started with a tomato soup that had a swirl of infused olive oil atop it. Maybe basil? He liked it. We shared a tri-colored orzo pasta salad. I remember tiny bits of onion, red pepper, peas, pine nuts, cheese and a tangy dressing. I also remember it being pretty darn tasty because I couldn't stop eating it. Finally, we shared Sun-dried Tomato + Artichoke Quiche (mixed greens, red wine vinaigrette). 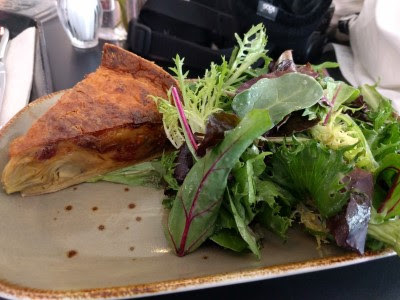 I had never had artichokes in a quiche before. Or with eggs. Or even thought of trying that combination. But it worked - it was really tasty. Tangy from the sun-dried tomatoes and artichokes. But one of the tastier quiche slices I've had. It's a little pricey for lunch, and the menu is maybe a little limited. You order at a counter and then take a seat and they bring your food to you. 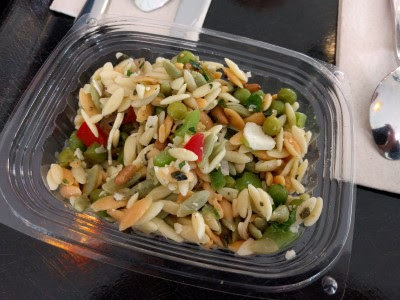 Some things, like the orzo salad, are pre-made. It was good. It was convenient. It was nice to sit inside at a table and relax even if it was kind of a cafeteria feel. It was just a bit of a pricey lunch, but that's to be expected at a museum in a park.